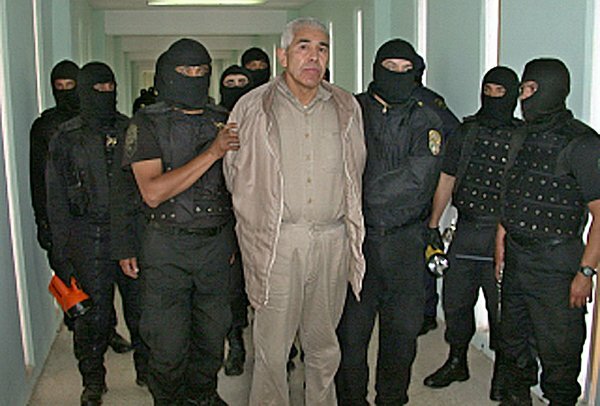 After serving 28 years, Rafael Caro Quintero, a founding member of the now-defunct Guadalajara Cartel, was quietly released from a Jalisco state prison in the early hours of Friday morning. Caro Quintero had been serving a 40-year sentence for ordering the abduction, torture and murder of Drug Enforcement Administration (DEA) agent Enrique Camarena Salazar in 1985. He remains wanted by U.S. authorities but late Thursday night a federal tribunal in Guadalajara overruled Caro Quintero’s conviction, having found that he was improperly tried in a federal court for crimes that should have been treated as state offences. As he had already completed sentences for killing two other U.S. citizens in Guadalajara and running two marijuana plantations in Chihuahua – and there were no outstanding charges against him in Mexico – the court ordered Caro Quintero’s immediate release. He left the Reclusorio Preventivo Metropolitano prison on the outskirts of Guadalajara at around 2 a.m. Friday. Born in 1952 into a campesino family in Badiraguato, Sinaloa – the same municipality where Mexico’s most wanted drug kingpin, Joaquin “El Chapo” Guzman, was born – Caro Quintero left home aged 18 to work as a truck driver, but soon took to cultivating marijuana on his father’s land. He reaped enormous profits and went on to form the Guadalajara Cartel along with Miguel Angel Felix Gallardo and Ernesto Fonseca Carrillo, alias “Don Neto,” in the 1970s. The cartel grew rapidly into the most powerful in Mexico, smuggling huge quantities of heroin and marijuana into the United States and becoming one of the first Mexican gangs to partner with Colombian cocaine traffickers. Now extinct, the Guadalajara Cartel eventually split into some of Mexico’s largest drug-trafficking organizations, such as the Sinaloa Federation, the Tijuana and Juarez cartels, and the defunct Sonora Cartel, which was at one point headed by Caro Quintero’s brother Miguel Caro Quintero, who is currently serving a 17-year sentence in the United States. As head of the Guadalajara Cartel, Caro Quintero was seen as a pioneer of the drug trade in Mexico and in the 1980s he became known as the “Narco de los Narcos.” At the age of just 29, he already owned 36 houses, had invested in around 300 Guadalajara businesses and amassed an estimated fortune of 500 million dollars. Caro Quintero’s demise began in November 1984, when Mexican authorities raided his enormous El Bufalo ranch in Chihuahua and burned thousands of tons of marijuana, causing losses in the billions of dollars. Camarena, a DEA agent based in Guadalajara, had been working undercover and was responsible for leading the authorities to the plantation. Enraged, Caro Quintero ordered Camerana’s abduction. 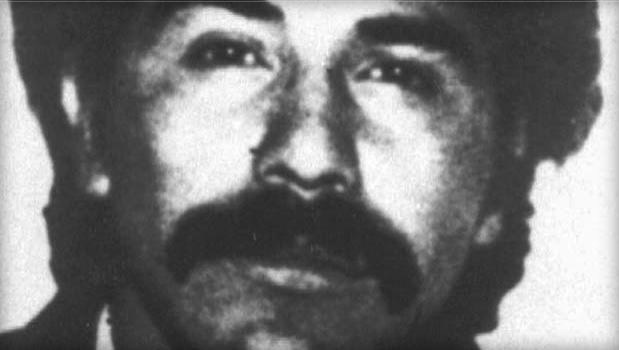 In February 1985, he was seized in broad daylight as he left the U.S. Consulate in Guadalajara to meet his wife at a local restaurant. A month later, Camerana’s body was found – along with that of his pilot Alfredo Zavala Avelar – in a shallow grave in Michoacan, showing clear signs of torture. The incident caused a massive uproar north of the border and severely strained relations between the United States and Mexico. A special DEA unit was dispatched to Mexico to investigate Camarena’s murder, while at one point U.S. customs agents almost blocked the border with Mexico, slowing incoming traffic to a standstill while conducting thorough searches of all Mexicans trying to enter the United States. Caro Quintero was arrested in April 1985 in Costa Rica, where he held several luxury properties. He was found in possession of a gold-plated, diamond-encrusted firearm, 300,000 dollars in cash, one million dollars’ worth of jewelry and two luxury sports cars. Also detained was his girlfriend Sara Cristina Cosio Vidaurri Martinez, the daughter of a former education secretary in Jalisco and the niece of Guillermo Cosio Vidaurri, an Institutional Revolutionary Party (PRI) politician who governed the state from 1989 to 1992. Upon being extradited to Mexico and found guilty of kidnapping and killing Camerana, Caro Quintero was jailed in La Palma, a federal prison in the State of Mexico. Although he was convicted of enough crimes to warrant 199 years of imprisonment, the 40-year jail term he received is the maximum sentence permitted under the Mexican justice system. Among the other charges against him, Caro Quinero was also found guilty of the murder of U.S. citizens John Walker and Alber Radelat, who disappeared after stumbling into a private party at a Guadalajara restaurant frequented by drug-traffickers in January 1985. Caro Quintero was among those present and a witness said he had the two men seized and taken to a restaurant storeroom. The pair, who may have been mistaken for DEA agents, were reportedly stabbed with ice picks to force them to explain why they had entered the restaurant. Walker had been living in Guadalajara as he researched a novel on Mexico’s criminal underworld, while Radelat had just flown in to visit him. Their bodies were found in a well north of the city five months later. Caro Quintero had completed his sentence for both killings prior to his release on Friday, the court in Guadalajara noted. A few years ago, Caro Quintero was transferred to Jalisco’s Puente Grande, a high-security federal prison located just southeast of Guadalajara on the highway to Zapotlanejo, before being moved again to the adjacent Reclusorio Preventivo, a medium-security state facility. The case for his release, presented to a tribunal in Guadalajara this week, was based on the fact that the federal charges against him were invalid – he should not have been tried in a state court because his victims were neither diplomatic or consular agents. The ruling has set a precedent which could soon lead to the release of Caro Quintero’s Guadalajara Cartel partners, Fonesca Carillo, who was arrested in Puerto Vallarta in April 1985, and Felix Gallardo, who was eventually detained in 1989. Both are currently serving 40-year sentences for Camarena’s murder and numerous other charges, but the former’s attorney said this week that he had filed an appeal based on the same grounds as Caro Quintero’s case, and expected his client to be freed within 15 days by a different court in Jalisco. Should Fonesca Carillo be released then it might only be a matter of time before Felix Gallardo is also freed on the same grounds. In 1987, Caro Quintero was indicted in absentia by a California court for the murder of Camarena, plus additional murder charges, possession of marijuana and cocaine with intent to distribute, and for running a criminal enterprise. The following year, he was indicted again in California for breaking federal laws against extortion, corruption and drug trafficking, while he was also found guilty of drugs charges by a court in Arizona. The DEA still lists Caro Quintero among the most wanted international fugitives on its website, while the U.S. Marshalls offer an unspecified reward for his arrest. Despite having been incarcerated for almost three decades, U.S. authorities believe Caro Quintero continued to run illicit activities from behind bars. In June, the Treasury Department imposed sanctions against 18 people and 15 companies that allegedly moved money for Caro Quintero. These include many Guadalajara-based businesses, such as Pronto Shoes, also known as CX Milan Guadalajara; El Baño de Maria, a beauty product store with outlets in many of the city’s major plazas; Barbaresco, a popular restaurant in Guadalajara’s upmarket Providencia neighborhood which stands accused of laundering 3.7 million dollars by a court in Texas; Hacienda Las Limas, a luxury spa in southern Jalisco; and a number of local construction and energy firms. Curiously, Caro Quintero’s release comes just two weeks after his relative Sandra Avila Beltran, better known as “La Reina del Pacifico” or the “Queen of the Pacific,” was released from jail in the United States. Accused of having been a powerful figure within the Sinaloa Federation, Avila struck a deal with the prosecution in order to face reduced charges and was sentenced to 70 months by a Miami court last month. Having served more than five years in a Mexican prison prior to being extradited last year, she was immediately eligible for release and was expected to return to Guadalajara with her family. For more on Caro Quintero’s criminal exploits, his close ties to the Mexican government and the Jalisco authorities, and even his links to the CIA and the Contras in Nicaragua, see this excellent feature in VICE. Duncan, I no longer use this email address. I tried to get my new address switched, but couldn’t do it. Can you change my address to I really want to stay connected to your blog.